Alongside the launch of the Apple Watch, many third-party businesses have found room to expand their organizations, or create completely new ones, with various collections of charging stands, band swapping websites, and even more rugged cases for Apple's new wearable. These cases, it should be noted, work in conjunction with Apple's previously existing band options. One of the more notable accessory manufacturers to throw its hat into the Apple Watch case ring is Speck, with a line of multi-colored cases for the Apple Watch, called CandyShell Fit, launching later this month. Speck promises the CandyShell Fit is perfect for customers with an intensely active lifestyle, as it "provides full bezel protection to guard the smartwatch's glass screen, defend against shock, and allow complete access to the digital crown and side button." 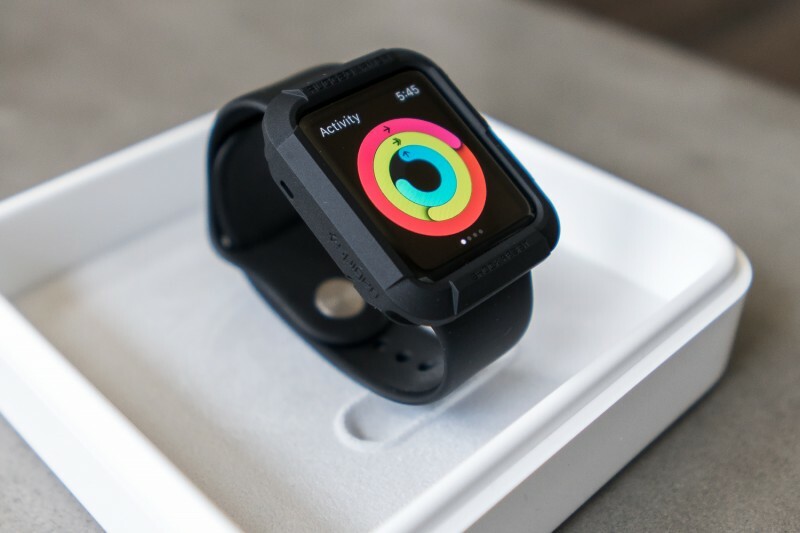 "You only need to do a few things to protect Apple Watch, but you have to do them perfectly and minimally, and in a way that fully honors the design of the device," said Bryan Hynecek, Speck VP of Design. "Speck is about giving people the courage to live their life fully and completely with Apple Watch on, exactly as it was intended to be used." The case combines a hard polycarbonate outer layer shell and a TPU interior to work in combination at providing exterior and interior shock absorption, respectively. The case includes a slightly raised bezel above the Apple Watch touch screen - about 1.5mm - in order to act as a protective bumper between the Watch and outside environment. As expected, the CandyShell Fit has been put through a test of basic high intensity activities to see its reaction to sweat, high temperatures and even basic sunscreens and lotions. 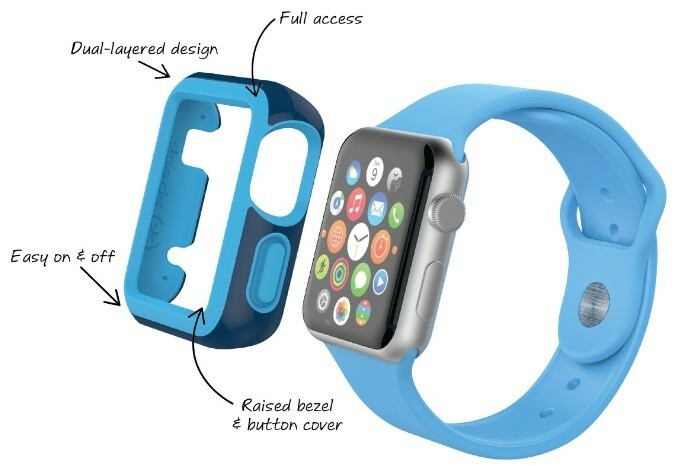 Speck says the new Apple Watch case will launch in multiple colors "later this month" and be priced at $29.99. Popular accessory manufacturer Spigen also has a range of Apple Watch accessories on its website, from stands to screen protectors. It also provides a diverse array of durable cases for the Watch, providing various degrees of thickness and protection to customers interested in protecting their Apple Watch. Ranging in price from $14.99 to $24.99, Spigen provides increasing degrees of drop and hazard defense to the Apple Watch in multiple color options - including a transparent "liquid crystal" version. The company also promises each case provides full availability to the Watch's heart rate sensor and two side buttons. A few MacRumors forum members have posted screenshots and short reviews on some models offered by Spigen. Most users note the general addition of bulk onto the somewhat slim basic Apple Watch case, but if true protection is desired it doesn't appear to be too bad of a trade off. Another durability-focused Apple Watch case, called The Bumper, began taking pre-orders a few weeks ago and plans to begin shipping sometime in June. 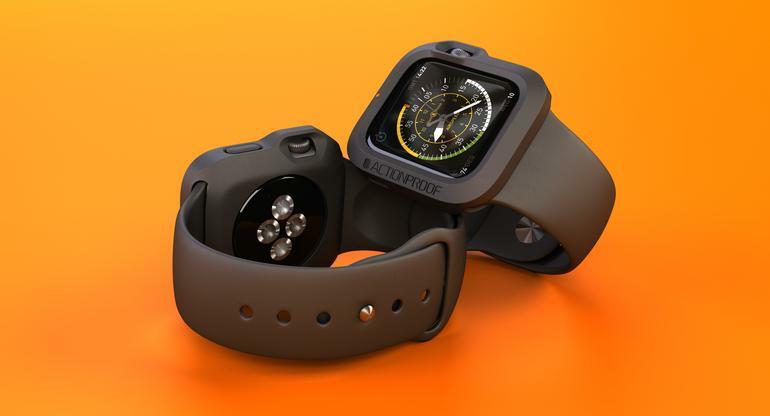 The Bumper's ultra-resistant rubber material allows for ease of use when inserting and removing the Apple Watch, with the 360 degree shock absorbing case providing full access to the touch screen, Digital Crown, contacts button, speaker, microphone, and heart rate sensor. The case also appears to be the only third-party Apple Watch case that provides protection to the Digital Crown while still allowing Apple's new input device to be fully rotated and pressed. The Bumper will be available in white, black, and orange, and those interested can pre-order The Bumper right now for $35 on ActionProof's official website. With the nascence of the Apple Watch, there will no doubt be more and more options for various protection-related Apple Watch accessories as we move further into the year, with other companies getting their hands on their own models of the wearable. Given that some of these manufacturers created useful accessories before even having an Apple Watch in hand, it'll be interesting to see what other third-party companies do moving forward. MY EYES! Help there's acid in my eyes! I was thinking about this and if the fact I'm so against these is hypocritical. I always cover up the beautiful and slim design of the iPhone with a case so why shouldn't I the watch? Obviously dropping isn't a concern as much as it is with the phone. But swinging into walls isn't a concern with the phone like it is the watch. Still, that said, I may be a hypocrite but I still think these are ridiculous and overboard. This is beyond ridiculous. Do people wear a case and a screen protector for their Timex or Rolex too? Disagree with most commenters. Great idea. Love the elegant design of Watch for casual and normal activities. But I like to rock climb, mountain bike, do carpentry, and other activities that could scratch the watch. Would be nice to have a slip on protector for those occasions. Why wouldn't you protect a $350 or more investment but also make it useable? Everything about the apple watch is completely ridiculous.